Rockid is an interesting and convenient combination of a chair and a cradle. It's also perfect in terms of compatibility as these two furniture items usually go together inseparably. Now this inseparability can be quite literal. 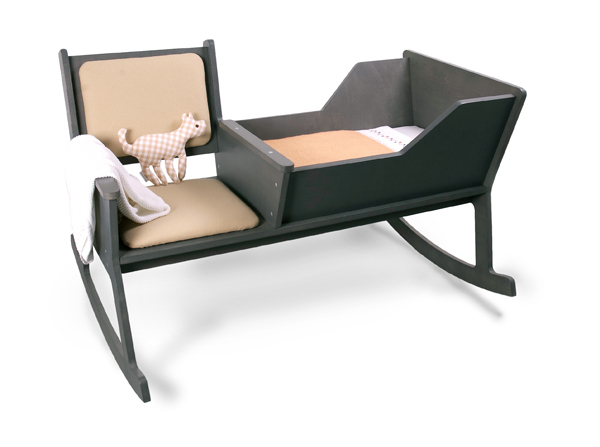 Rockid combines a rocking chair and cradle to make it more convenient putting babies to sleep. Rocking the chair makes the cradle move too. Designed by Ontwerpduo the Rockid was made of coated birch ply wood. It comes in black, gray and green. A rocking chair and cradle in one. While softly swinging the rocking chair and reading a book or singing a lullaby, the baby falls asleep. When the baby outgrows the cradle, it is possible to reconstruct the rockid into a rocking chair. The designers have also thought the moment of child growth through. After the cradle is no longer necessary Rockid can become a regular rocking chair. Useful and multifunctional. What do you think? This is a really nice simple cradle rocker, I will be making an updated modern danish influenced version very soon.